As a child, Patrick Konrad tried many sports – football, running and jiu-jitsu – but when he finally discovered cycling it was love at first sight, and he decided to pursue a career here. So he joined a local team before turning 14, raced against older boys and scored some strong results from the first races, which gave him the confidence that he can become a successful pro one day. Then, as the years passed, the young Austrian began to show his potential in some of the most important amateur races, like the Course de la Paix or the 2013 Tour de l’Avenir, where he finished third. That result announced what was to come a year later, when Patrick Konrad had an excellent season, winning the Oberösterreich-Rundfahrt and a stage in the prestigious Triptyque des Monts et Châteaux, as well as coming 4th in the Tour of Austria, behind three World Tour riders, all much more experienced than him. A very strong climber, the 23-year-old Austrian also has a fine time trial, and these skills combined with his impressive CV were for enough for Bora-Argon 18 to take him as a stagiaire for the summer of 2014, before giving him a contract. 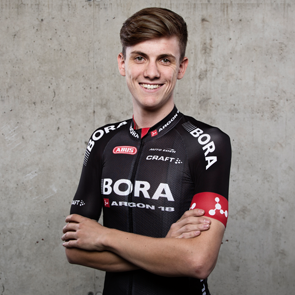 Now, entering his first pro year, Patrick Konrad has huge ambitions and is very determined to build on the results he had in the U23 ranks, in order to show everyone that he has a nice future in the sport’s biggest stage races. – Patrick, you began cycling around a decade ago. How popular was the sport back then in your country? When I started cycling it was ok, we had some good international pros, like Georg Totschnig, whom I remember winning a mountain stage in Tour de France (ed. 2005, Ax 3 Domaines). When I started cycling I did it with some friends; we were 8-10 young guys, a really nice group that had fun all the time on the bike. – Does it get more media attention now? Yes, in the mean time cycling became more famous in my country, the media and the newspapers are more interested, because there are many young new talents in Austria, like Riccardo Zoidl, Matthias Brändle, Georg Preidler, my teammate Daniel Schorn and I, as well. Now we have a mix of good young riders and the media and the journalists know that, they are interested in the way we prepare in the winter and how we perform during the season. – You’re a strong climber and a good time trialist, but is there something that you will like to improve? To be frankly, I want to be better in both. I had a good time during the training camp in Mallorca, I did an aerodynamic test and the team really supported me so far. As I said, I’m keen to improve my climbing and ITT, because I want to show my talent in stage races and I want to get as soon as possible good results for my team. – Let’s talk about your results as an U23 rider. How important was winning the Oberösterreich-Rundfahrt? It was a really huge victory for me, it was my first win in an U23 stage race and it was even more important as the Oberösterreich-Rundfahrt was the home race of my team at that time. It was really important for us to get a big result there. Fortunately, my season planning was fine, everything worked and I got the victory. – Less than one month later you came fourth in the Tour of Austria. What did it mean for you to finish ahead of so many World Tour riders? It was a really nice week for me and it showed me that I can perform well in a professional peloton. That result gave me a lot of confidence and now I’m happy to get a chance from Ralph Denk to race for Bora-Argon 18 and show my talent in the next two years. – Speaking of this, how did you end up signing with Bora? During the Tour of Austria they told me that they want me to join them for the rest of the season as a stagiaire. Then, after I did a couple of races with the team, they informed me that I can stay as a pro and I was very happy about that. – Did you get to talk with the management about the expectations they have from you this year? Yes, and they told me I have to show myself in stage races. After the Challenge Mallorca I will start the Tour of Oman, and in March I will do Tirreno-Adriatico. My race program is really good, the training camp was excellent and I’m very confident for my first races. I’m really excited to do Tirreno-Adriatico, it will be a very nice experience and I’m prepared to give my best there and to help my team. I hope I’ll make everyone happy. At the moment, it’s not 100% sure, but I also might go to the Giro del Trentino and Liège–Bastogne–Liège later in the season. – Do you have any personal goals? I want to get as fast as possible very good results and victories for my team. One of my biggest goals is to start the Tour de France this year. I know I have to give my best until then, so we’ll see how things will pan out. I know I’m young, but I want to have a good form in the first part of the season and maybe this will help me get a place in the team for the Tour de France. It would be really great if I will be there. As for the years to come, I know that my future lies in the stage races and I will love to win a hard mountain stage in a big race. To be quite frankly, it doesn’t matter which race it is, as long as I get a nice victory.